Golden Sun GBA Game Boy Advance Game Cartridge Cleaned Tested and Guaranteed to Work! I used to play Golden Sun as a child, and it still has all the charisma from back then! The soundtrack is beautiful. As for the cartridge, it arrived in perfect condition. 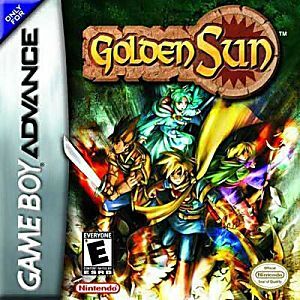 Golden sun is an amazing serie of games! It works perfectly and was shipped quite fast! this game is awesome, and hard to find, I tried to buy from amazon for 20.00 but got sent a GBA game that did not work, I was furious. Lukie games are the best in the U.S.
BEST GAME EVER! I don't even HAVE the game yet but I've seen lps and this game ROCKS soooo much I'm getting the game and the gameboy mini thing just to play it! I've known about the series since I was a kid, but I just recently picked up Dark Dawn and wow, I was hooked instantly. Being so, I had to play the original. The graphics far exceed what I expected of a game from 2001. I really enjoyed the RPG dungeon crawler style of the game, refreshing, but nostalgic. A great game, definitely a must-play classic. When I played this game I loved how it began from the intro you can tell it will be epic. At first when I first saw the the battle system i felt it was going to be like pokemon but I was so wrong. The sprites and animation along with the background graphics and music make each battle epic. Camelot tries to make you feel like the player and in my experience it worked really well. I felt like the main character from beginning to end in this epic first book of Golden sun. Golden Sun is an wonderful game with a great cast of characters and a very good plotline. The battles are turn based and the attack animations are incredible with a wide variety of attacks to choose from. This is a great game that I would recommend to anyone.